This website has gone through a number of versions, and I thought I might take a moment on this page to talk about the various versions. This website began its existence as a site called Jot&apos;s Scratch Pad. It contained a few pieces of my writing and a few stories that could be continued by visitors. This was not very successful. It was also a boring site with no layout. The second iteration came when I moved all of the contents of JSP onto a new server, cut the user-updated storied, added some color and some other content, though I don't remember what that content was. I do remember that it included a page about me, which JSP hadn't. I changed the name of the site to Mind of the Writer and designed a new index, which had several paragraphs about me and links from words within those paragraphs. The idea I had was that every paragraph on the site could contain links to other pages, just as one thought in a person's mind might lead to others. This was also not wildly successful. In fact, it could be considered a flop, on the whole. Thus, I began the third iteration. I renamed the site Skreyola's Drailen for reasons of search-engine viability, personality, and coolness. I kept all the old content, changed the color scheme, added tables for the neat sidebar and content body layout, and began adding various bits and pieces. This went well, though the level of feedback improved only marginally. But I wasn't greatly thrilled with it, myself. So I decided that the website should receive an overhaul. I still liked the name, and I didn't have any reason to change it again, so I decided to keep it for the fourth iteration. I chose mostly new colors, changed the layout, and restructured the design of the links between pages. After several months, I decided my website was glorifying me instead of glorifying God, so another change of design was in order. In this fifth iteration, I changed the background, incorporated stylesheets to make further changes easier, added the background image, and defined the whitespace area, as well as doing other changes. It is my hope that the website now glorifies God more than myself. 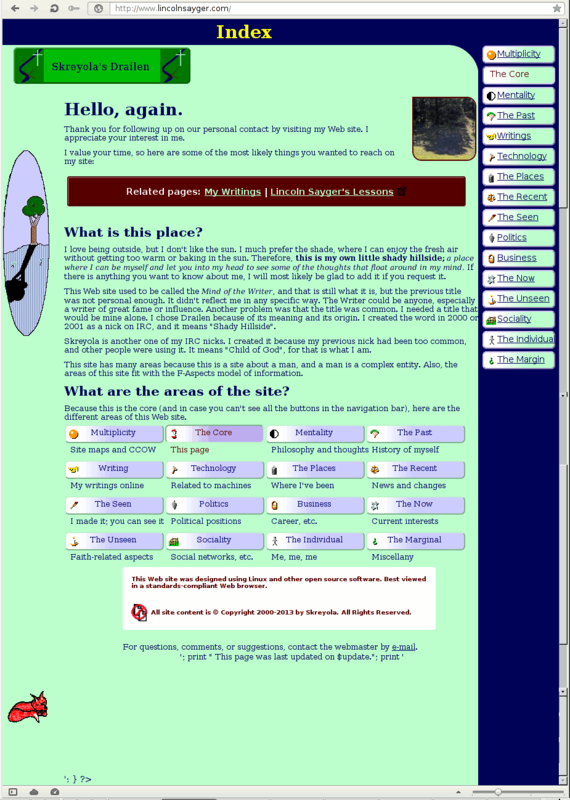 In April of 2004, I added some navigational threads (The rounded box at the top of each page) in the hopes of making easier your navigation of this site. In October of 2004, I decided to make the switch from a table-based layout to one based on CSS-positioning. While I kept the colors and most of the basic layout the same, the new format made the text flow more dynamically, and I was no longer using evil tables for my main layout. Unfortunately, the navigation threads did not display properly to my satisfaction as div elements, so they remained table-bound. One important note about the new layout was that the side image was given a class that will make displaying it only on a normal computer screen a trivial matter. In December of 2006, I decided that more visibility to my writing would increase my chances of publication, which in turn would glorify God more. So, I changed the structure of the site and the layout of the main page. I took this opportunity to change the color scheme, too. At this time, I figured out a reasonably reliable method of encapsulating the navigation threads into CSS rather than tables, so they are no longer table-bound. This iteration also has a difference between the index and the subpages. For the eight iteration, I redesigned the site using the new design techniques and principles I had learn in my Newspaper Design class, changed the color scheme, and moved all of the content (that I kept) from the old code to a new, template-based code that is intended to be easier to maintain. Theoretically, the ninth iteration of this Web site will involve merely choosing new colors and deciding what pages to remove or add... unless I decide on a new layout, but even that should be much easier to accomplish. The eighth iteration ended when my ISP stopped offering Web hosting as part of the service package, and the site went on hiatus. But eventually, I decided to relaunch the site under my own domain name. For the ninth iteration, I decided to put the new things I'd been learning to good use, further decrease the maintenance overhead, and provide myself with a hub from which people I talked to at gatherings of one sort or another could find the topics we'd discussed. I especially wanted an easy way to point people to whatever business site I had running at a given time, since the business market is so fickle. I made some master templates for the header, footer, and navigation and included these using Perl's HTML::Mason framework. I kept the same basic idea for the layout but reordered the structure significantly. The site went from four (five, counting Poland) sections matching a front-page layout to 16 sections matching the HolOrdIyu concept of aspects. I chose a new color scheme, returning to green for the main background. I've rounded a lot of the corners and tried to make the layouts of the various legacy sections more consistent. This site was launched on May 20, 2013.